Today the 7 Exercises finally kicked off with the YKON tutorial: “How to become a Practical Utopian in 3 Easy steps” The event took place at the first of the Random Bars, the very charming Armory. 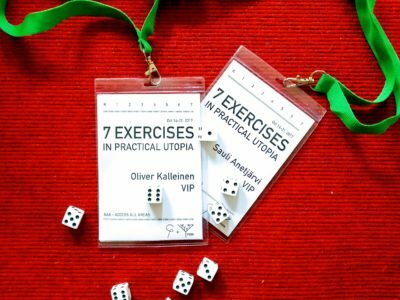 The Tutorial followed 3 steps guiding participants to think and act like a Practical Utopian. : (1) Observation, (2) Imagination and (3) Modification. In your life, have you ever done something that you could consider remotely Practical? In your life, have you ever done something that you could consider remotely Utopian? What kind of feelings the words “Practical Utopia” evoke in you? 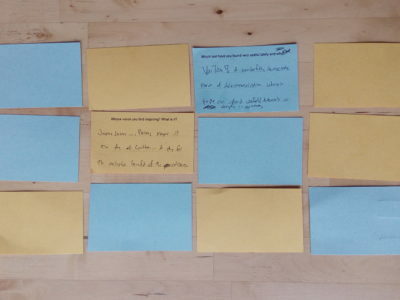 After this moment of self-reflection participants left the random bar alone for a walk around the block, to sharpen their outwards oriented observation skills. Notice something that you would remove! Notice something that you would add! As a practical utopian one need to train the imagination. YKON developed a small game for this purpose which participants played in duos. It’s called Match-Match. The games goal is to come up with imaginative explanations what a random combination of a practical idea and a Utopian idea could mean. YKON will publish the game on this blog shortly for you to play it at home. As a practical utopian one need to be ready to implement small and big changes in oneself and in the surroundings to create a possibility for practical utopias. Participants decided to make a modification to one of their attitudes or behaviour traits using YKON’s well-known PMD aka Personality Modification Device. Furthermore participants picked a secret mission with the aim to modify the situation right there and then in the Armory. We don’t know if everybody succeeded with their secret mission, but the evening was for sure helping to create the right mindset (perhaps described with: practical & utopian, serious & playful, critical & imaginative) for the upcoming 7 Exercises.